Jackie has Multiple Sclerosis. We matched her with canine partner Babs. 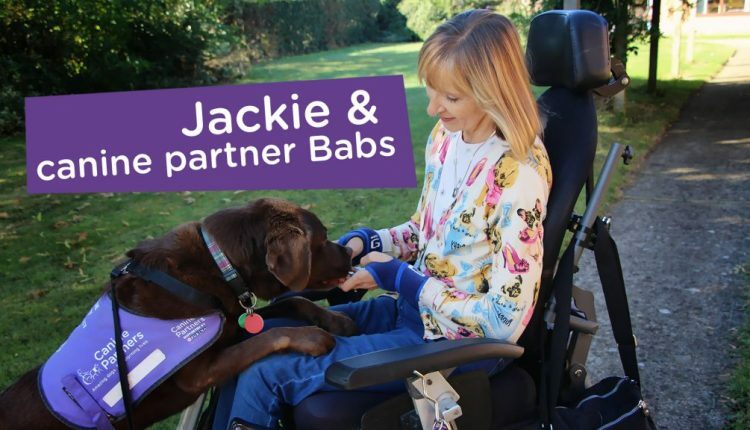 My name is Jackie Topp, I am 55 years old and my canine partner is Babs. We were partnered in 2015 and I had been on the waiting list for about 11 months so I was very lucky to be partnered so quickly. I have Multiple Sclerosis (MS) and I have been a wheelchair user for a long time, about 25 years. I’m not able to walk around and my condition is degenerative which means I can do less and less as the years go by. I had my first evidence of MS when I was 22, but I wasn’t actually diagnosed definitively until I was 29. Before Babs, my husband and I had a little Jack Russell terrier. He was lovely but he was pretty useless at doing things for me! He sadly passed away in 2013 and I said to my husband ‘I think I really need a dog that can do something for me’ as I have seen my friend with her canine partner. I knew it would open up so many avenues for me, so I applied. I was always asking my husband to get me things and pass me things, so I wanted to become more independent. I am an independent person so I wanted to be able to do things for myself or have something that would be able to do those things for me. That’s what Babs means to me. Although the things I ask her to do are really small, they make my life so much easier. I had to rely on my husband, he was everything. He helped me do everything and did it all for me when I couldn’t do it myself. Without Babs there doing everything she does now, I had to keep asking him to do really small tasks, like getting me the TV remote and those sorts of things. It really irritated me because why can’t I get it myself? It was difficult and really hard as I didn’t like to ask people to do that sort of thing for me. I first came across Canine Partners when a friend had a canine partner. I thought ‘wow, this is something I can really find a benefit from’. So I made my application and thought I would be waiting a really long time. I was lucky as it didn’t take as long as I thought. Babs had been partnered with someone else before me but had been returned because the person was moving to a care home and wanted to give her to someone who needed her more, which I think was really selfless and I’m so grateful for that person. She was matched with my needs and 11 months later we brought her home. Babs does lots of things for me, mostly anything to do with bringing things to me or taking things away. She’ll help me by taking of my shoes, socks and trousers off, she’ll take off my coat, she’ll bring me slippers or shoes, and she’ll take my gloves off. She’ll open drawers and doors, taking things out of drawers and passing them to me. She’ll help me get the washing out of the washing machine and sort things into piles. She can also get the milk out the fridge and go shopping with me, where she’ll get things off the bottom shelf for me and she can also get the milk out of the big crates for me because sometimes they’re so far back I can’t reach them. It’s so helpful, but sometimes I think I need a giraffe because neither of us can reach the top shelf! Babs has particularly helped me with my confidence in the last nine months. My husband died last year in February and having Babs has really helped me to cope better with that loss. She’s my reason for getting up in the morning and my reason for going out. She makes me get out and talk to people and to get fresh air, otherwise I wouldn’t go out at all. I can’t imagine life without Babs now. I don’t know what I’d do without her. I couldn’t not have her in my life now for many reasons. She’s the closest thing to me with a beating heart. I really couldn’t do without her. Thank you Canine Partners for giving me my partner.